Adventure Force v. Rival: The Conflict Expands! Reddit user LUOFY034 made a nice find earlier today on Walmart’s website, showing that Prime Time Toys’ foray into ball blasting has proven successful. 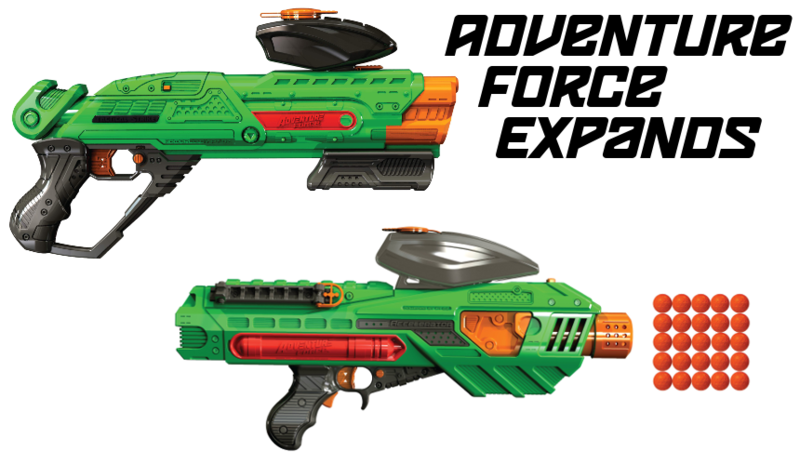 As posted, the Adventure Force line (Walmart’s in-house branding for many toys, like Stats Blast currently is and Air Zone was for ToysRUs) is getting two new blasters. While they may not be innovative, they’re undoubtedly going to be less expensive than the Nerf option. Pump up for a super-charged match with the full motorized Adventure Force Tactical Strike Accelerator! Choose the red squad or blue squad team color marker to easily track the competition in the heat of battle. The Accelerator launches Tactical Strike foam rounds up to 100 FPS (feet per second). 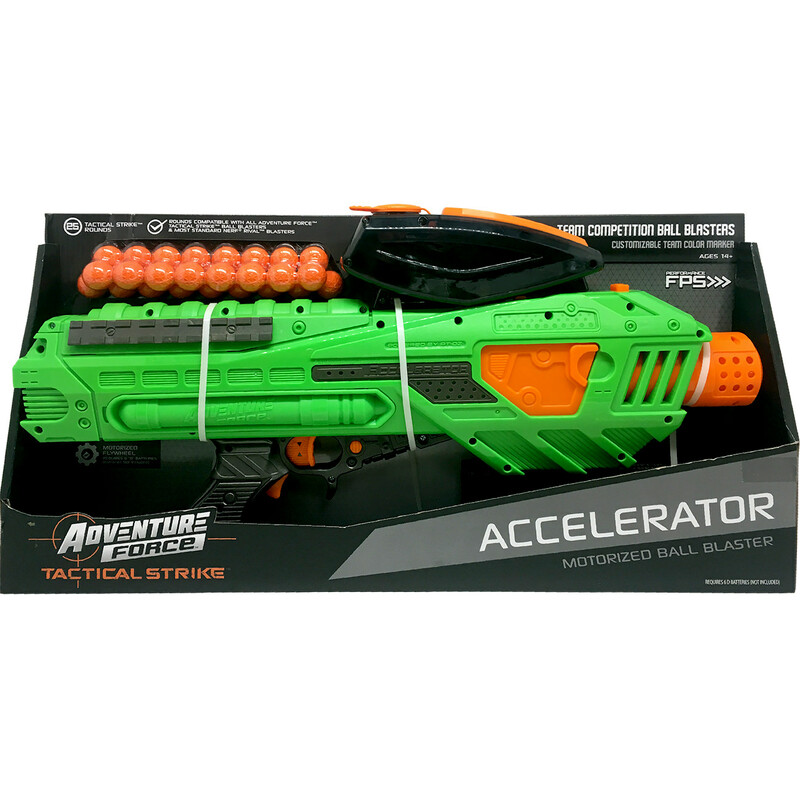 The Accelerator holds 25 rounds and auto feeds them into the blaster with the Ammo Hopper. Tactical Strike rounds are compatible with all Tactical Strike ball blasters & most standard Nerf Rival Blasters. Mask sold separately. Recommended for Ages 14+. 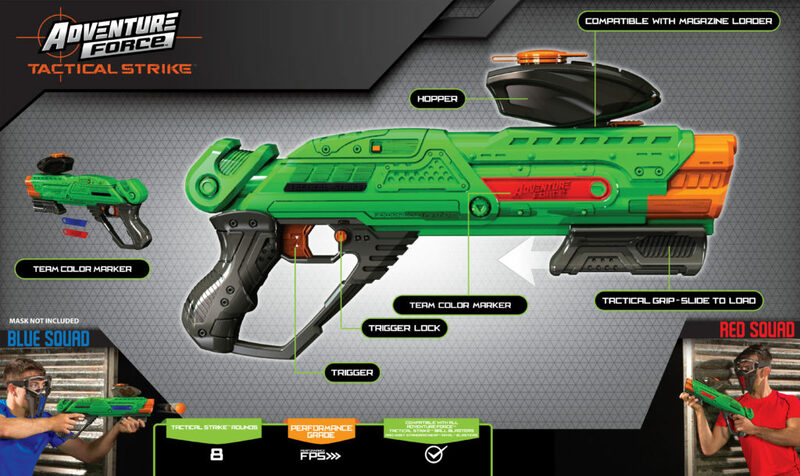 Requires 6 D batteries (not included) or compatible with Nerf Rival Rechargeable Battery Pack. Battery Pack sold separately. 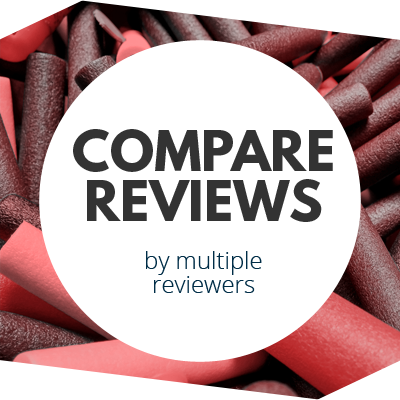 Tactical Strike rounds are compatible with all Tactical Strike ball blasters & most standard Nerf Rival Blasters. I find it insanely interesting that Prime Time Toys, while ensuring compatibility in ammo and parts, is shying away from mags in favor of hoppers. In this case, their version of the Zeus holds 25 rounds. 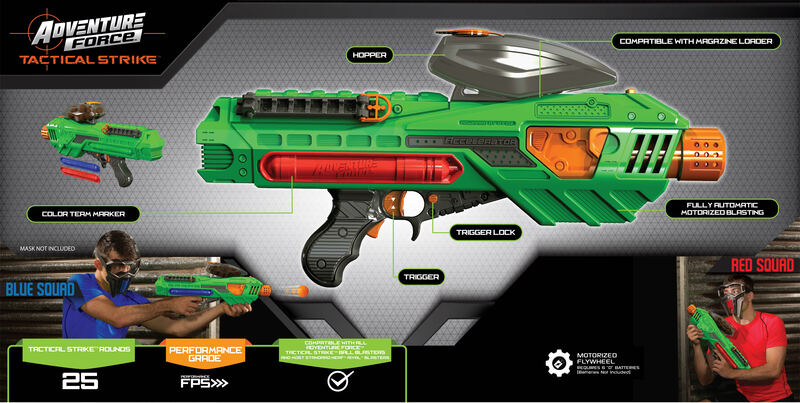 It will even use the same Nerf-branded rechargeable battery, if you have one. The team colors method seems inadequate, since most people are going to be focused on the green color of the blaster, but it’s still a nice touch. You can load magazines if you have them, of course. They’ll just be sticking out the top of the blaster. I like how they placed the tac rail off at an angle to accommodate for the hopper. At least someone noticed that in the design phase. 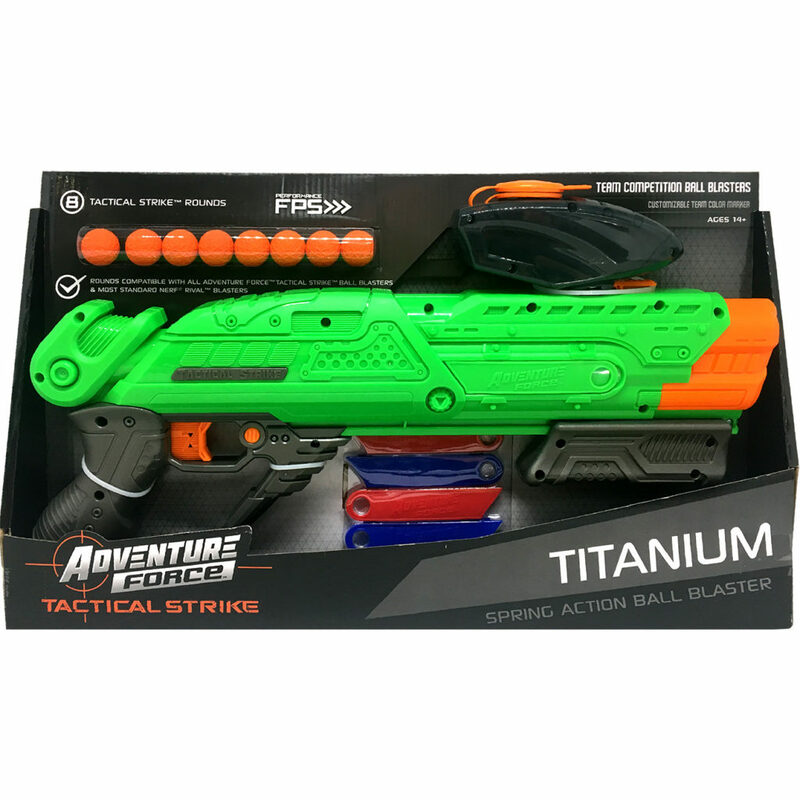 Choose your team color and head to battle with the Adventure Force Tactical Strike Titanium ball blaster. 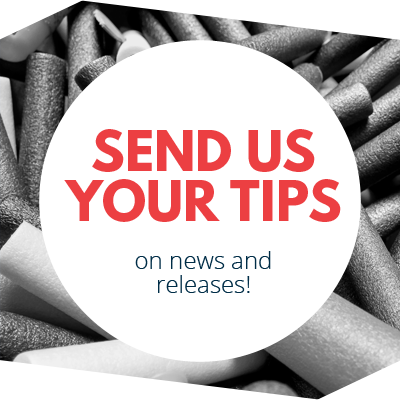 The Titanium launches Tactical Strike foam rounds up to 100 FPS (feet per second). Quick-Load Hopper holds eight foam rounds. The pump-action blaster cycles through rounds as quickly as you can pull back the tactical grip slide and release the trigger. Tactical Strike rounds are compatible with all Adventure Force Tactical Strike ball blasters & most standard Nerf Rival Blasters. Mask sold separately. Recommended for Ages 14+. Unsurprisingly, it’s a revamped version of the Powerball that’s been on Target shelves the past few months. If the original is any indication, this one should work just as well. I would also hope that the 25 round hopper from the Accelerator is compatible with the Titanium. Again, thanks to LUOFY034 over on Reddit for spotting these. I’m excited to see some solid competition in more than just dart blasters. A full line of blasters challenging Rival (with the backing of Walmart) should hopefully push for better blasters all around. This entry was posted in News/Updates and tagged adventure force, prime time toys, rival, Walmart on November 28, 2017 by BuffdaddyNerf. IMO the titanium looks amazing.